A unique solution to the problem of ensuring that the hauliers that discharge Tankered Waste Water at Sewerage Treatment plants are carrying what they are supposed to be carrying! Having been approached by a major UK utility in the early 1980s, when the Government passed a bill through parliament to stop the spreading of raw sewage to land, with a request to modify a machine monitoring system to count volume, the first Tankered Waste reception logger was developed. 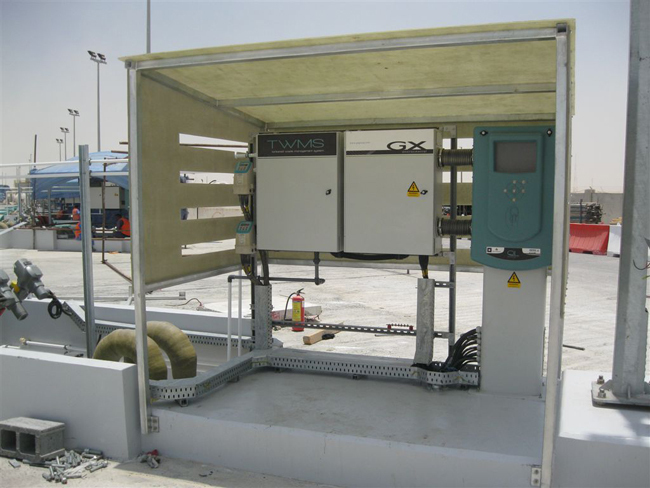 To date we have installed Tankered Waste Water Monitoring systems in all the major UK Utilities and have been working with Overseas clients since 2003. The solutions are more biased towards the administrative control of WHO is allowed into the plant, HOW MUCH are they hauling of WHAT TYPE of waste, WHERE did it come from and WHAT IS IN IT? Having the ability to create a transaction record automatically for every discharge into every inlet line at every reception station instantly and display those records live to anyone, anywhere in the world with a Login and Password, gives Waste Water Treatment Works Management and Plant Personnel alike the “real time” information they need on a daily basis to ensure the optimum plant performance. Combined with this the more recent developments by GX Environmental of Pre Discharge, In Line and On line analysers mean that the plant can now also be protected from loads containing banned or toxic waste that could have previously damaged or even shut down the plant! It has been our experience that when full systems including automated sampling are introduced to reception sites that there is an immediate reduction in the hauliers that would have tried to bring damaging loads into the site as it naturally acts as a major deterrent. As the samplers and sampling techniques become more highly developed and sophisticated the odd few that still try to conceal dangerous chemicals or toxic waste are being identified and banned. Having widened our operations since 2003 it has also been necessary to make the identification of the vehicles, their capacity and expected contents simpler for the system to recognize as in many countries, such as the Middle East, the different languages and nationalities of the drivers means that minimal manual input is essential. By issuing a RFID key fob or even fitting an RFID tag into the windscreen of the vehicle the only requirement can be reduced to the driver hooking up the bauer coupling to the discharge line. The GX Environmental Tankered Waste Reception Logger will see the vehicle drive into the discharge lane and immediately, dependent on clients requirements, identify the registration number, capacity and billing status of the account. If all is acceptable the driver will hook up the bauer coupling and press GO. The discharge will commence and if at each sampling pass the criteria for the parameters being monitored are within limits the discharge will continue until the system sees “no flow” i.e. the tanker is empty. The QL800 Logger will signify “valve closing”, the driver will unhook and drive away. Time of transaction start, vehicle registration, volume discharged, time to discharge and any other information relevant to the client will be immediately stored in the Logger and sent via a cellular communications link to the TIDON (Transaction Information Direct Online) internet based central Management Reporting system. The drivers’ involvement has been to simply drive in, hook up, press go, wait till empty, unhook and drive away. No signing forms, no finding site personnel to validate his load, no manual data input of any kind. Unless of course a sample fails during discharge! This will generate an alarm on the system, if necessary alarming not only at the discharge line but also at the central TIDON system and if required to the mobile phones of site operational personnel to attend the line. The failed sample will be held by the Tankered Waste management system for removal to the laboratory for precise identification of the reason for failure. The consequences of attempting to discharge dangerous or unpermitted waste are obviously down to each individual client. The system is not built or designed to replace operational site staff but to assist them in the day to day running of a complex system that can be so easily compromised without a “real time” accurate solution to monitor potential transgressors effectively.